Different counties have their own standard mattress sizes. Manufacturers even within one country might have measurements of particular brand mattresses defined by its unique specifications. No matter whether it is metric or imperial system actual sizes of a few mattresses might differ in width and length up to 1 inch or 1 centimeter even if the products defined into the same category. Second row is mattress sizes in metric system – length and width in centimeters (cm), area space in square centimeters (cm²). There are mattresses like three quarter with dimensions 48” x 75”, or Olympic queen mattress (extended queen) with actual measurements 66’ x 80” discontinued from production and many stores do not carry these sizes any more. All images are resized proportionally to the height of a human body and actual mattress dimensions. 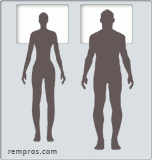 - Average female heights 5’ 4 ½" or 1.638 meter (163.8 cm) were considering as a standards. 26” x 20” (app. 66 x 51 centimeters) pillow size was taken as a standard for mattresses dimensional proportions comparison. Changing in sizes indicates how mattress dimensions increasing or decreasing comparing to previous size. Thickness of a mattress may range from 5” to 20” and will depend on the amount of layers and type of a mattress. Typically 12 – 14 gauge coil inner springs quality mattress will be 9” – 16” high plus couple inches thick pillow top for comfort. Memory foam mattress topper usually 1 – 4 inches (2.54 – 10.16 cm) in thickness. Foam mattress is a combination of foam layers with density from 3 lb/cu ft (48 kg/m³) to 7 and 1.5” – 4” in thickness each. Quality foam mattresses are usually 10” - 14” thick. Total heights of mattress might vary from 10” including low profile foundation to 30” with a high foundation. Traditional mattresses typically shipped in plastic what will not add any extra inches. Many memory foam mattresses might be rolled and placed into cartons for shipment which vary in dimensions accordingly to the mattress size. Some products might be even compressed to fit into smaller 18”, 24” or 48” boxes. Also some mattresses might have special requirements and cannot be transported vertically but only in horizontal position. Twin size mattress might be as light as 30 lb or as heavy as 60 lb depending on a type of a mattress. The weight increase proportionally with increasing the mattress dimensions. Some king size mattresses can easily weight 150 – 180 pound or 68 – 82 kilograms with a typical 70 – 120 lb of foundation. Consider numerous of factors while shopping for a new mattress. Analyze not only mattress dimensions but room size as well. If the bedroom is smaller than 10’ x 11’ huge 6’ 4” wide and 6’ 8” long king mattress will eliminate nearly 39% of a bedroom space making it hard to fit any other furniture. Longer sizes preferably for taller people.